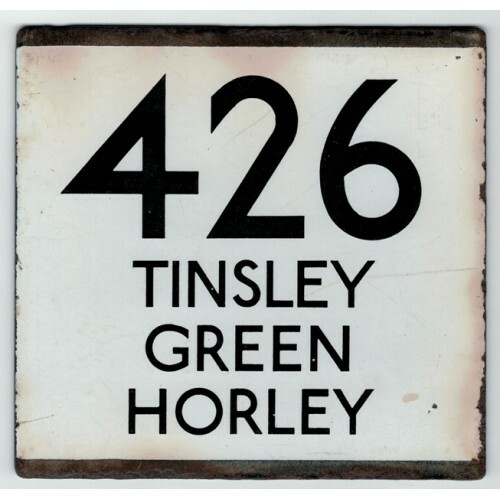 This auction is for an enamel London Transport Country Area Bus Stop e plate for Route 426 Tinsley Green Horley. It is approximately 130mm x 125mm and weighs around 250g. Route 426 was a circular service in the country area running on Mondays to Saturdays from Crawley (The George) via Three Bridges, Horley, Povey Cross, Charlwood, Ifield and back to Crawley, in both directions. This 'e' plate will have come from Crawley Bus Station where bus ran in both directions. It is in reasonable condition with weathering and some chipping as expected on very old plates (see photo).